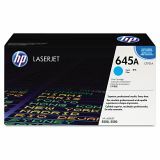 HP 645A, (C9731A) Cyan Original LaserJet Toner Cartridge - Get the best results from your HP printing system by using this Original LaserJet Toner Cartridge. HP Smart Technology and chemically grown toner formula work with you HP Color LaserJet 5500/5550 Series printers to deliver accurate, consistent color and reliable, cost-effective performance. HP Smart Technology provides easy-to-use automatic alerts, on-line ordering and easy installation. Color cartridge yields approximately 12,000 pages. 18.90" x 6.30" x 10.40"